Pictured below is an image and ad copy for a fake. These acoustic phonos have been making the rounds over the last ten years, and for the most part, are re-worked 1950s vintage portable "suitcase" acoustic phonos made to look like vintage machines. They have been popping up in antique fairs and some dealer shows. Experienced collectors can spot them right off for their obvious inaccuracies. I was shocked and amazed to find the following ad in the prestigeous "Toscano Design" catalog. These folks are know for their great selection of garden gargoyles, Scottish sword reproductions and exotic repro-retro home office goodies. My guess is that their "buyer" scored these and thought this would make a great addition to their wares. At least they do acknowledge the fact that they are "refurbished," but referring to them as "Authentic Antiques" is a stretch at least. For more information on how to spot a Crap-O-Phone, Click Here. 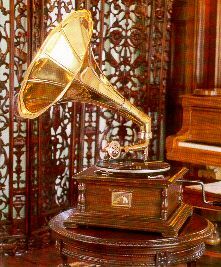 Thank you for giving us more information regarding the gramophone.